You don't need an expensive toolkit to build your own computer, but there are a few simple electronics tools that you absolutely must have. All of these can be easily obtained at almost any computer store or online. You may already have some of these tools. If not, then the easiest way to get the tools you need is to purchase a computer repair tool kit that contains all the tools you'll need, as well as a handy carrying case to keep them organized. As with all tools, you should buy the best quality computer tools that you can afford. Good tools last longer and make the job easier. All computer tools should be non-magnetized. Screwdrivers and nut drivers. You should have, at a minimum, small- and medium-sized Phillips and flat screwdrivers and a 1/4" nut driver. 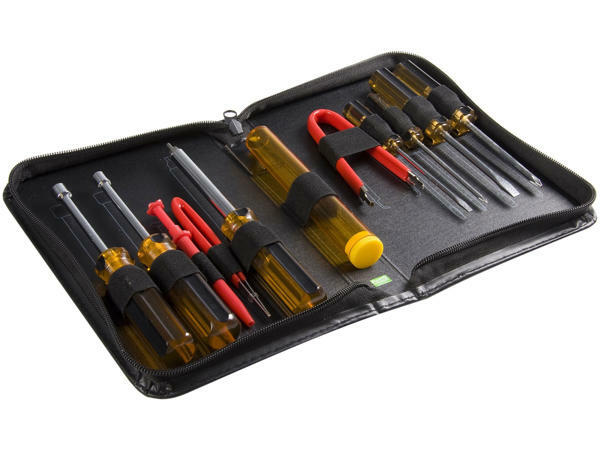 A precision screwdriver set should have all the screwdrivers you'll need. Needle-Nosed Pliers or Forceps. Very small needle-nosed pliers, forceps, or tweezers are very handy for removing and inserting jumpers on motherboards and hard drives. Cable Ties. Plastic cable ties are useful for neatly bundling wires and cables away from fans and other components inside the computer. Anti-Static Kit. An anti-static kit consists of a rubberized mat and a wrist strap that attaches to both the mat and the computer or electronic device you're working on. This both protects the equipment from static damage and protects your tabletop from scratches. Click here for more information about anti-static precautions. Heat Sink Compound. Heat sink compound improves the thermal efficiency of heat sinks and improves cooling. It's sometimes included with processor fans or heat sinks, but may also be purchased separately. It is applied neatly to the area where the processor contacts the heat sink to improve cooling efficiency. (Some heat sinks have the compound "built-in" behind a little peel-off label.) I like Arctic MX-4 or other silver-based thermal compounds. Canned Air or Canless Air Duster. Canned air or a canless air duster air is used to blow dust out of the nooks and crannies of your computer. Never blow into a computer with your lips to remove dust. Your breath contains too much moisture (and maybe other things depending on what you ate for dinner). Also, never use a household vacuum cleaner nozzle to clean inside a computer. They generate way too much static. Pill Bottle or a Small Container. You'll need a pill bottle or other small container to hold the various screws, jumpers, and other small parts used to assemble and configure a homebuilt computer.